Sydney Queer Irish co-founder Loretta Cosgrove with Panti Bliss at the 2017 Mardi Gras. This Saturday, I will join 80 strong Sydney Queer Irish (SQI) community members to proudly march (more accurately dance!) up Oxford St in Sydney’s 40th Mardi Gras parade. It's 40 years since the first march in 1978 was met with unexpected police violence. 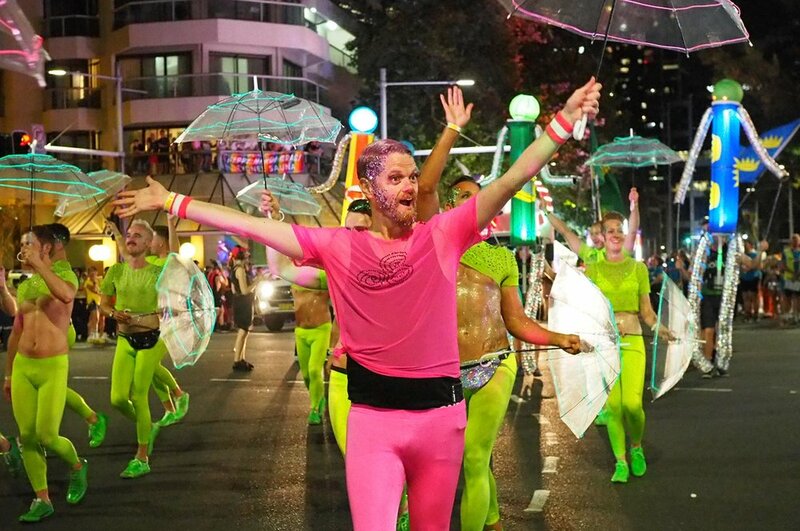 This Mardi Gras parade is extra special as it aims to celebrate the community’s struggles and triumphs and the evolution of Mardi Gras. SQI, too, remembers our own LGBT journey at home over the past 40 years. I am the president and founding member of SQI, an organisation emerging from late night conversations in my kitchen with a group of friends who wanted to create a social support network for Irish ex-pats and those with Irish ancestry who also identify as LGBT, queer or just left of centre. I am of Irish-born parents, a proud Mayo man and equally proud Galway woman. I lived in Clonbur, Co Galway until I was six. We emigrated to Australia in the 80s. Since then I have spent years back and forth living in both Ireland and Australia and feel patriotic to both my home countries. Ireland will always be ‘home’ for me and I have a huge community in Co. Galway. Settled in Sydney (for now! ), I feel very proud to be an Irish gay woman and love to connect with the Irish community. As a result, in a suburb in Sydney’s Inner West, SQI was formed in 2010! SQI has been a saving grace for me and many ex-pats from Ireland who have joined us over the years. Whether your stay in Australia is long, short, permanent or fleeting, SQI offers a home away from home for the Irish LGBT community. We are also very proud of the connection we have made with other Irish community groups in Sydney and the support of The Consulate General of Ireland, whose ongoing assistance is invaluable. The 2016 SQI Mardi Gras entry. By far, SQI’s biggest event of the year is our celebrated Mardi Gras entry. To achieve an award-winning float takes months of planning and preparation. In the days leading up to the parade, members are making last minute touches to costumes and props, doing final choreography rehearsals, as well as holding down day jobs! Every year we are oversubscribed with eager float applicants, and we are joined by people flying from Ireland and interstate. This year’s Mardi Gras theme is ‘Evolution’, and our entry celebrates Ireland's road to equality over the past four decades. Our small island has embraced love, equality, modernity and LGBT rights, while still celebrating our rich history, tradition and culture. In remembering our much loved Dolores O’ Riordan, The Cranberries’ track Dreams helps us celebrate our Irish pride and brings together a choreographed group with a mix of traditional and modern dance. Our costumes and props will showcase the Irish tri-colours of green, white and orange, with each section representing a decade over the past 40 years. The green marchers, with their shoulder-pads ready for battle, represent the first LGBT protests in the 1970s and the foundation of the Irish gay rights movement. Our winged white marchers pay tribute to those impacted by HIV/AIDS in our community in the 1980s and beyond, and the various Irish gay organisations who formed Gay Health Action (GHA) in response to the crisis. The gold/orange section, in their flower covered broken chains, represents the decriminalisation of homosexuality in the 1990s. Sounds like a lot of work? It is! It’s also a huge amount of fun with the Irish community and friends. It’s about this time of year, a few days before the parade and planning in full-swing, that I say, “never again!”. Predictably, by Saturday night when it all comes together, cheered on by a roaring crowd, I’ll already be thinking how to grow Sydney Queer Irish and planning for next year’s Mardi Gras!